Not without good reason, the nation’s media have been focusing on the dramatically thin snowpack of the Upper Colorado River Basin, which portends a meager amount of runoff into the Colorado River system. 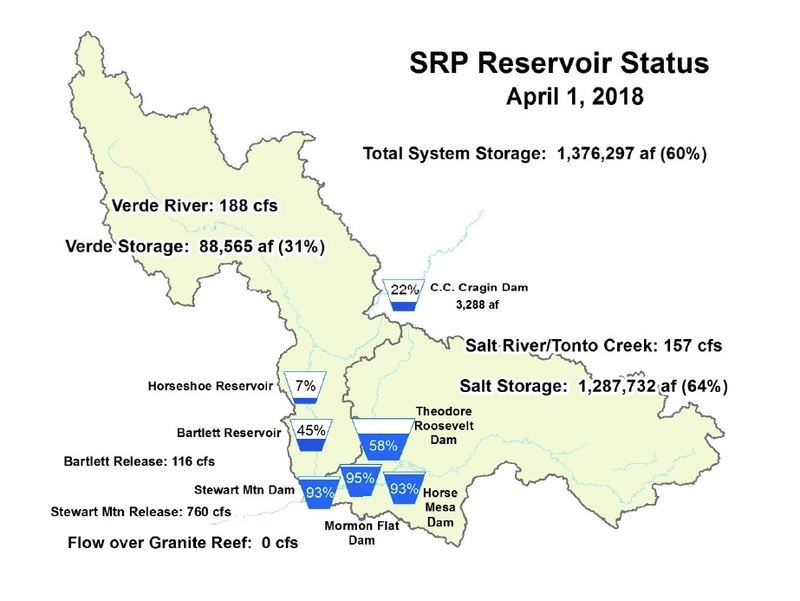 As of April 2, the basin snowpack stood at just 72 percent of normal, heralding a runoff season that may be the sixth driest in the 55 years that Glen Canyon Dam and Lake Powell have been in place to capture the runoff. On average, the in-flow into Lake Powell is 7.1 million acre-feet per season. Although the figure may change, this year’s projection currently stands at less than half that amount – 3.1 million acre-feet. Bad news? Oh, yes. But where Arizona’s renewable water supplies are concerned, the 2018 story gets still worse. As opposed to the Colorado River system, the in-state river systems are setting records. As a result, runoff in the watershed has been extremely poor. 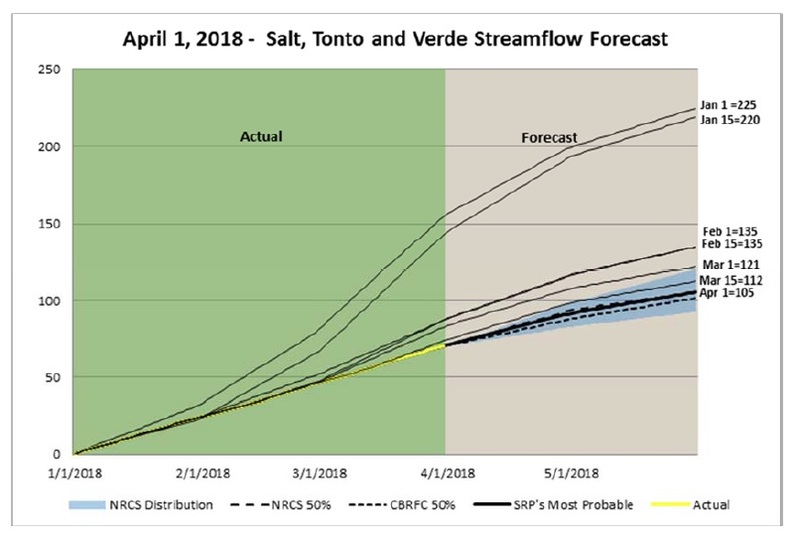 SRP data indicate that runoff into the Salt and Verde reservoirs in March stood at just 14 percent of median – the second-lowest amount on record. In the wake of a December – February snowpack season that produced next to nothing in the two Arizona watersheds, three small storms after mid-March produced a snow-water equivalent of just 22,000 acre-feet, most of it at the highest elevations of the region. 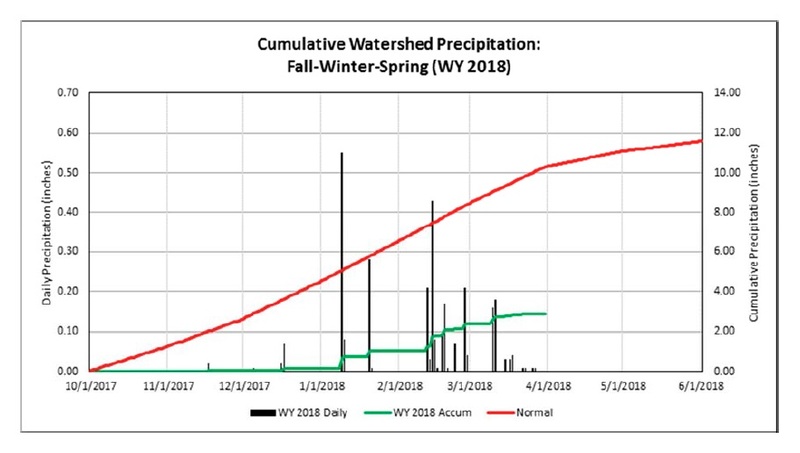 Overall, total watershed streamflow this runoff season (January -May) is forecast to be near the lowest on record, which stood at 106,000 acre-feet in 2002. SNOTEL data produced by the Natural Resource Conservation Service depict snowpack values as high as 40 percent of normal and as low as zero percent of normal. If you seek to frolic in the snow in Arizona, you’ll be hard-pressed to find white stuff for your skis: According to satellite data, just 0.3 percent of the watershed had snow coverage as of April 1. If winter in Arizona proved dry, early spring doesn’t hold out much hope for moisture here, either. Reports indicate that Arizona should anticipate warmer, drier weather through the first half of April, at least.